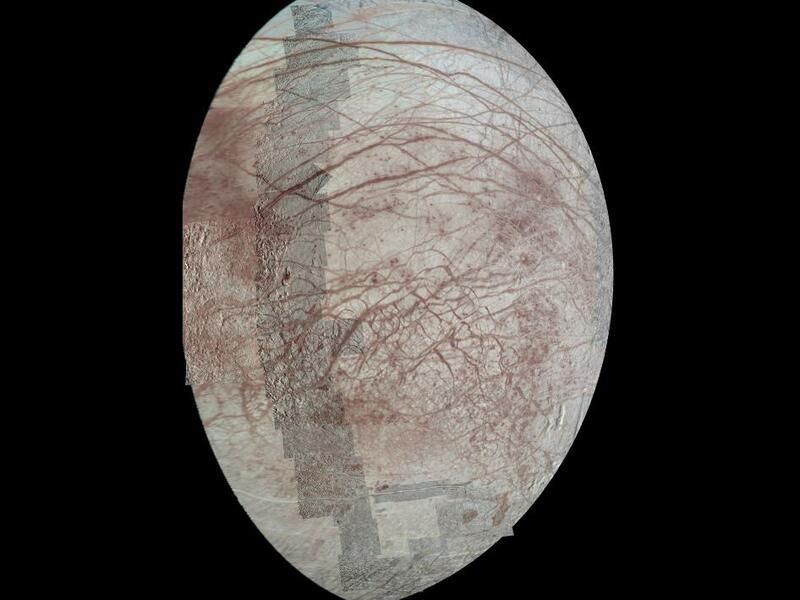 If you could lick the surface of Jupiter’s icy moon Europa, you would actually be sampling a bit of the ocean beneath. 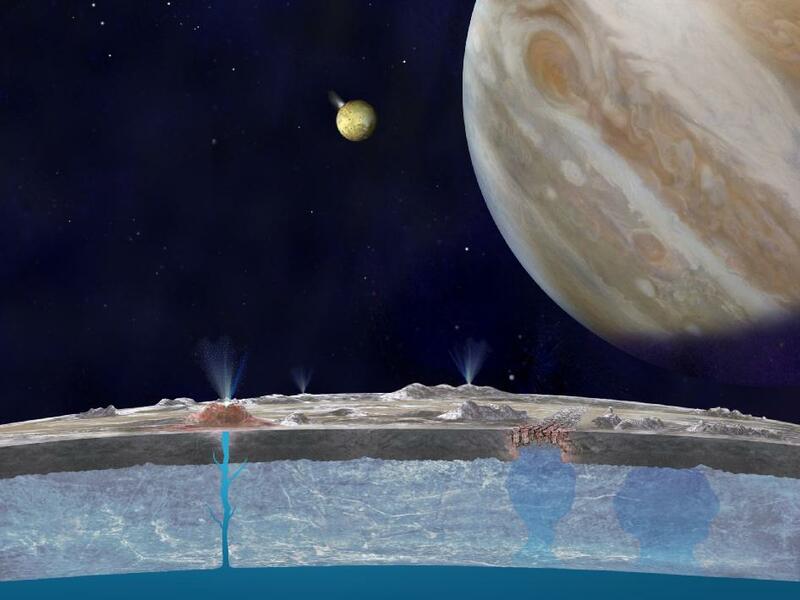 A new paper by Mike Brown, an astronomer at the California Institute of Technology in Pasadena, Calif., and Kevin Hand from NASA’s Jet Propulsion Laboratory, also in Pasadena, details the strongest evidence yet that salty water from the vast liquid ocean beneath Europa’s frozen exterior actually makes its way to the surface. The finding, based on some of the best data of its kind since NASA’s Galileo mission (1989 to 2003) to study Jupiter and its moons, suggests there is a chemical exchange between the ocean and surface, making the ocean a richer chemical environment. The work is described in a paper that has been accepted for publication in the Astronomical Journal. Europa’s ocean is thought to cover the moon’s whole globe and is about 60 miles (100 kilometers) thick under a thin ice shell. Since the days of NASA’s Voyager and Galileo missions, scientists have debated the composition of Europa’s surface. The infrared spectrometer aboard Galileo was not capable of providing the detail needed to identify definitively some of the materials present on the surface. Now, using the Keck II Telescope on Mauna Kea, Hawaii, and its OSIRIS spectrometer, Brown and Hand have identified a spectroscopic feature on Europa’s surface that indicates the presence of a magnesium sulfate salt, a mineral called epsomite, that could have formed by oxidation of a mineral likely originating from the ocean below. Brown and Hand started by mapping the distribution of pure water ice versus anything else. The spectra showed that even Europa’s leading hemisphere contains significant amounts of non-water ice. Then, at low latitudes on the trailing hemisphere—the area with the greatest concentration of the non-water ice material—they found a tiny, never-before-detected dip in the spectrum. The work was supported, in part, by the NASA Astrobiology Institute through the Icy Worlds team based at JPL, a division of Caltech. The NASA Astrobiology Institute, based at NASA’s Ames Research Center, Moffett Field, Calif., is a partnership among NASA, 15 U.S. teams, and 13 international consortia. The NAI is part of NASA’s Astrobiology program, which supports research into the origin, evolution, distribution and future of life on Earth and the potential for life elsewhere.